Backup with 128-bit encryption and Zip compression to CD, DVD, HD-DVD, Blu-ray, USB, FTP, SFTP, LAN on a flexible schedule under Windows 2000/XP/2003/Vista. Program can back up ?My Documents?, MS Outlook, The Bat, ICQ, Registry, Desktop items. 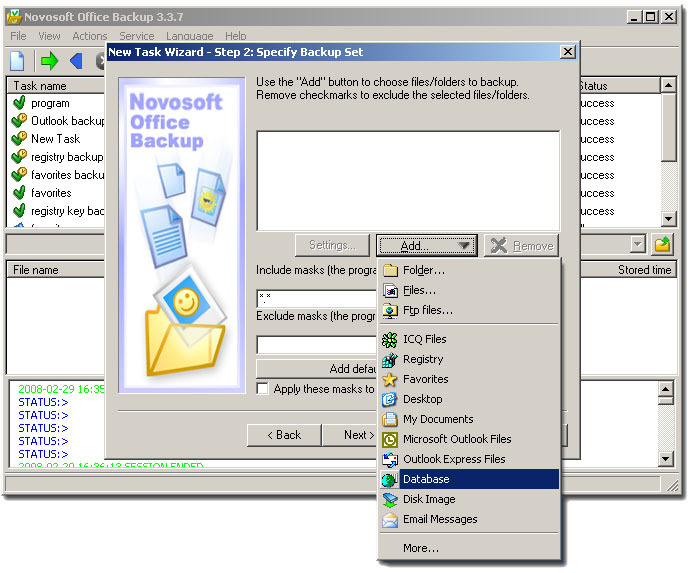 Novosoft Office Backup is a comprehensive backup solution with a simple and intuitive interface which allows doing backup of data under Windows 2000/XP/2003/Vista with 9 levels of Zip compression and 128-bit blowfish encryption to virtually any storage media including CD, DVD, HD-DVD, Blu-ray, USB, flash, FTP, SFTP, LAN and network drives. Novosoft Office Backup supports direct mail backup from mail server via POP3. The program can do easy backup of ?My Documents?, MS Outlook/Outlook Express, ICQ, Registry, Desktop items. More plug-ins are available for download from the program web site such as plug-ins for backup of ASDSee, Adobe Photoshop CS2, Firefox, the Bat Pro, AOL Instant Messenger, Spybot - Search & Destroy, Winamp, Windows Media Player, WinRar, WinZip, Yahoo messenger. In addition, you can apply file filters to select only the most critical data, and perform backups automatically on a flexible schedule with a minute accuracy or manually launch a backup task at any moment. It is also possible to schedule backups for execution upon system logon or logoff or before/after execution of any program. Two backup modes such as Standard mode and Expert mode allow for simpler or more specific adjustment of the backup task including backup with timestamps and versions to keep track of all file modifications and restore data files to a state in which they were at a specific point in time. Besides, Novosoft Office Backup supports one-way and two-way (mirroring) synchronization with which you can easily synchronize all of your important data files across multiple computers and devices. The option of running tasks as Windows service allows two or more users to do backup simultaneously even with no user logged on. While backup runs invisibly not interfering with other programs, the user is informed about its progress through email notifications and tray icon signals, as well as through a log file. A Wizard-like interface allows you to customize the backup options and the location to save the resulting backup file.The program can save your e-mail and news data, hotmail messages, accounts, rules, block senders, signatures and options. Outlook Express Backup Expert is an award winning email backup tool. It backup and restore messages, accounts, rules, block sender, address book, stationery & preferences for Outlook Express. It has multilanguage support and schedule feature. This site does not contain serial number, crack, keygen Novosoft Office Backup serial number : serial number is the simplest type of crack. A serial number(cdkey,product key,etc) is register the program as you may already know. a crack or keygen may contain harmful software. If you cannot find the exact version you want, just give it a try. for more information read .nfo/.txt/.diz file include in zipped file.